It’s Pizza Friday!!! This is a new spin on the normal Pizza Friday! 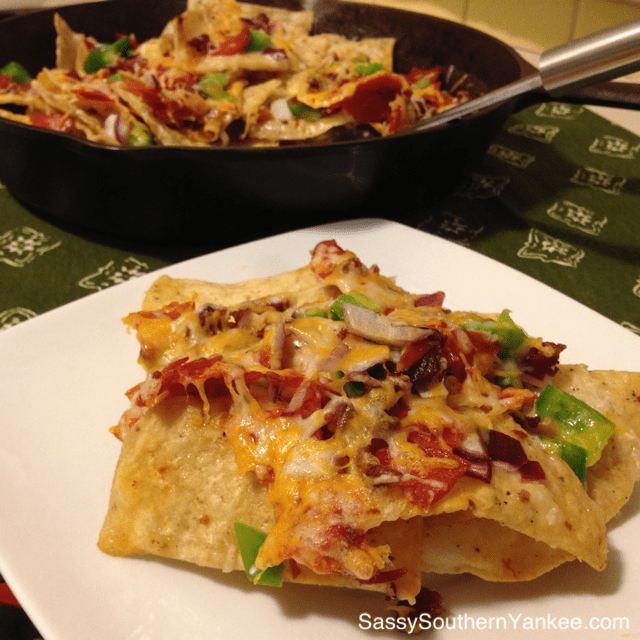 These Pizza Nachos are quick, and easy meal that everyone will love, even my gluten-free friends! I love these Pizza Nachos because you can mix and match the toppings to your hearts desire. From start to finish you can have these bad boys on the dinner table in 30 min, or less. The kids can help in the kitchen too! You can do most of the prep work ahead of time making Pizza nachos a great half-time addition to your Superbowl party this weekend! In a cast iron pan or on a cookie sheet empty the bag of tortilla chips and set aside. Now we will get started on the wonderful garlic cream sauce. It’s so good you are going to want to swim in it trust me. Using a microplane grate the garlic into a small sauce pan add the butter and olive oil. heat on low until the garlic becomes fragrant. Next add the pepper and red pepper flakes to “wake” them up. Add the cream stirring until it begins to bubble. Next add the parmesan cheese while stirring. The mixture will start to thicken. Remove from the heat and set aside once the sauce begins to boil. Next we are going to prepare our toppings. You can use whatever toppings you and your family like. 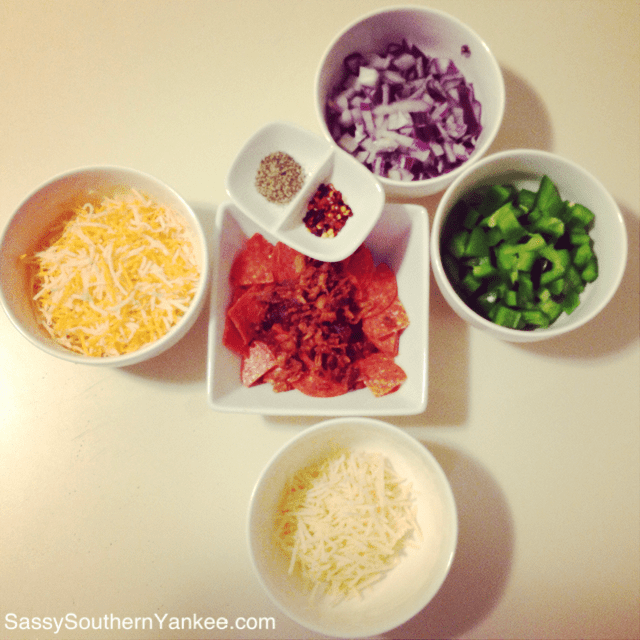 Dice, chop and prepare everything and get ready to have some fun assembling these delicious pizza nachos! Once you have all of your toppings ready to go, take the garlic cream sauce and pour it over the tortilla chips. Next add all of your toppings to the tortilla chips ensuring that everything is layered evenly. Sprinkle the 1 1/2 Cup of Colby Jack Cheese evenly over the pizza topped chips and pop everything into the oven for 7-10 Min until the toppings are heated through and the cheese is nice and melted. Serve Immediately. 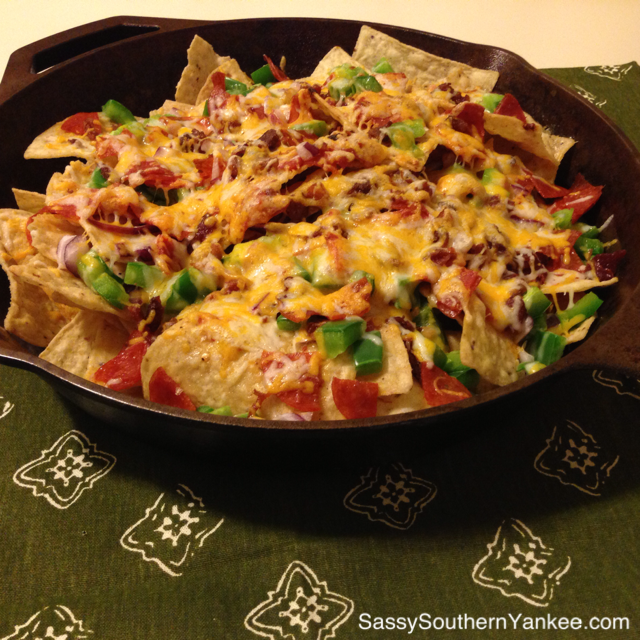 In a cast iron pan or on a cookie sheet empty the bag of tortilla chips and set aside. Now we will get started on the wonderful garlic cream sauce. It's so good you are going to want to swim in it trust me. 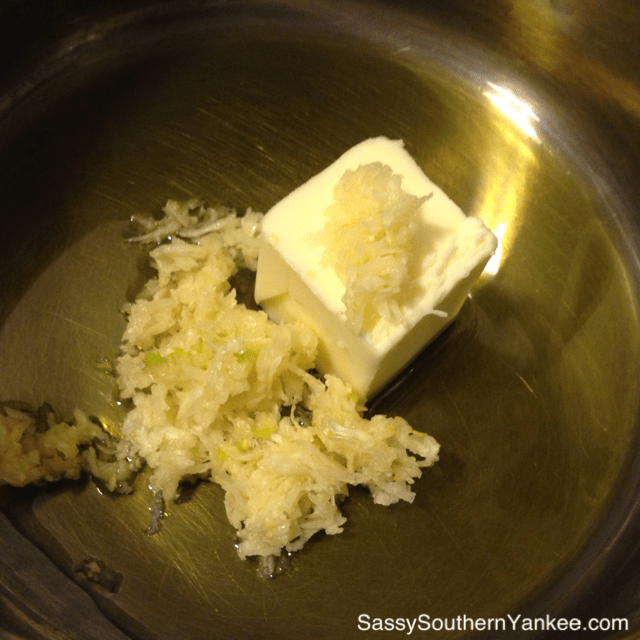 Using a microplane grate the garlic into a small sauce pan add the butter and olive oil. heat on low until the garlic becomes fragrant. Next add the pepper and red pepper flakes to "wake" them up. Add the cream stirring until it begins to bubble. Next add the parmesan cheese while stirring. The mixture will start to thicken. Remove from the heat and set aside once the sauce begins to boil. Sprinkle the 1½ Cup of Colby Jack Cheese evenly over the pizza topped chips and pop everything into the oven for 7-10 Min until the toppings are heated through and the cheese is nice and melted. Serve Immediately. 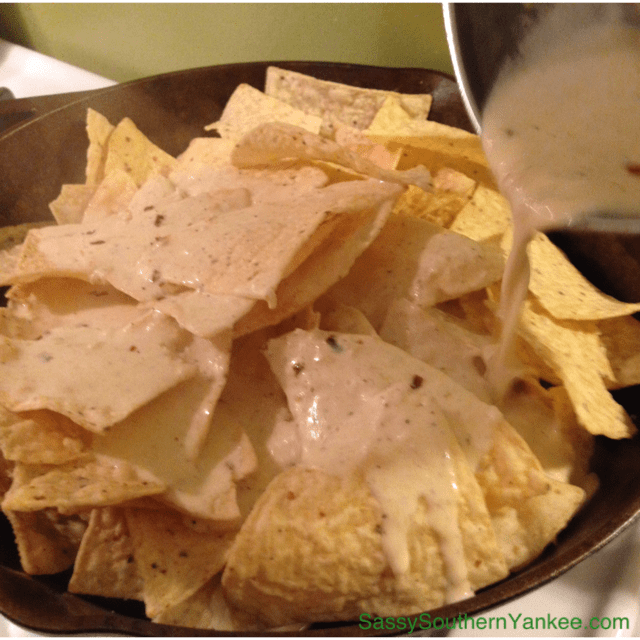 This entry was posted in Main Course and tagged Cheese, Garlic Cream Sauce, Gluten Free, Green Pepper, Onion, Pepper Flakes, Pepperoni, Pizza Nachos, Quick Dinner, Super Bowl, Tailgating, Tortilla Chips.